A group of musicians from Het Gelders Orkest (The Arnhem Philharmonic) decided last year to approach classical music in a different way. 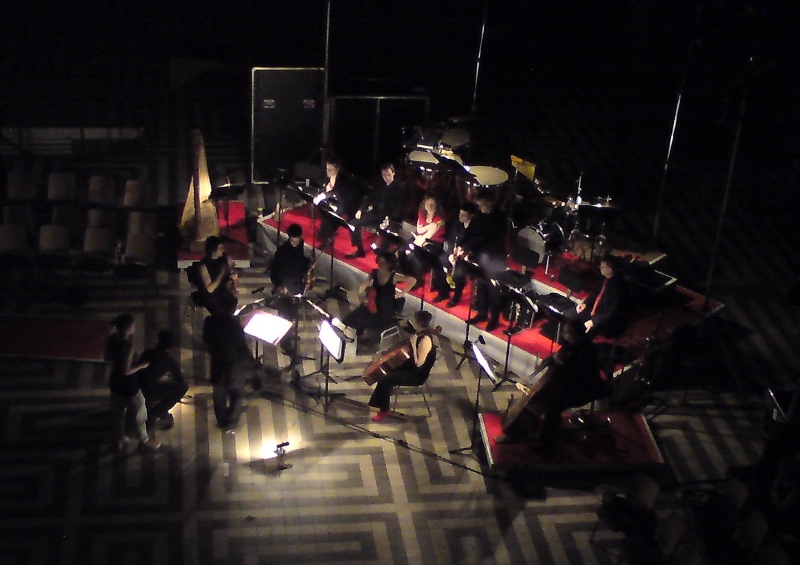 They founded the Gelders Orchestra Lab and gathered mainly young musicians and set up a programme of seven concerts. 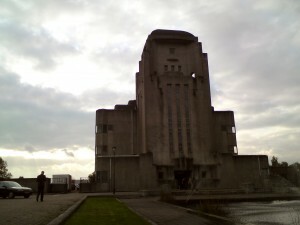 Last Saturday (March the fifth, 2011) the finale of the second show ‘LoveSeat’ played in the monumental radio transmitter building of Radio Kootwijk. This magnificent building was a radio transmitter to communicate with the Dutch East Indies and building started in 1918. It looks a bit like a cathedral. Two well-known works about love, two new and specially composed pieces with dance, video projections and space for finger-food and drinks, were the setting for an evenings’ entertainment. The bar opened around half past seven with mostly organic foods and drinks in stock. If you brought your own cushion, you would get a five euro discount. The finger-food packages for two – including a bottle of Prosecco – were up quickly. The musical portion lasted one hour and started at half past eight. In the middle of the circle which was formed by the audience on their pillows and chairs stood a lonely xylophone with its musician. The soft tones of the xylophone led the musicians walking around in the middle. This obviously had a certain meaning when the audience would still be standing, but the audience was sitting already, so it looked a bit awkward. On the other hand, musicians are perhaps not the people to use for a little play. Then the real work: making music. And that’s what musicians are for. The five classical pieces were combined with choreography by Lorenzo Borella. The beautiful, graceful movements of the dancers added much, though the effect could perhaps have been more challenging. Two of the five works were specially composed for the project. One by the Argentinian composer Diego Soifer which was very appealing. The other piece by the Canada born Graham Flett was at times hilarious rather than attractive. Fortunately this feeling disappeared quickly when the Siegfried Idyll by Richard Wagner set in. Although this piece was originally composed for a symphony orchestra, the master himself converted it for a small ensemble. The final Libertango showed the joy of dancing Tango. After the last tones faded away, a DJ appeared and got the public themselves on their feet with modern dance music. This kind of presentation – or better said fusion – of classical music, dance and entertainment can have a bright future. The musicians and dancers know their trade well. The combination of everything with the stunning location was a success. I want more.